"Black Diamond Interactive Ambiance Dock"
This is the black diamond interactive ambiance dock, reminds you of the phillips ambilight tv’s doesn’t it? Well i think it looks pretty good, and if the company that makes it gets the funding required it will be yours for roughly 50$. 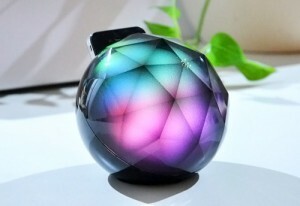 First and foremost the Black Diamond will serve as a colorful art piece sitting on your desk or bedside table, but other functions will also be available including voice controlled dynamic color effects, wake up and sleep functions and the ability to even let you know when a message from a friend has arrived based on an assigned color scheme. It’s a clever use of the iPhone while it’s sitting unused for syncing and/or charging, and if you think you’d like to help them reach their goal of $30,000 then head on over to CKIE where you can make an investment.